There is no question that having one central location for managing your action items is preferable. Often times, action items are created during a meeting and it is up to the note taker to re-create the tasks from the minutes or on the fly and distribute them to the responsible parties. Microsoft Outlook is the most widely used email system and includes a powerful built-in task system. MeetingBooster was developed with efficiency in mind, and includes a robust plugin which will synchronize action items created during a MeetingBooster meeting with the respective attendees Outlook task list. Tasks are assigned during the MeetingBooster meeting using the standard task dialog. When the parties responsible for the tasks install the MeetingBooster Outlook plugin, tasks created and assigned on the fly during a MeetingBooster meeting are automatically distributed to the respective attendees Outlook task list. 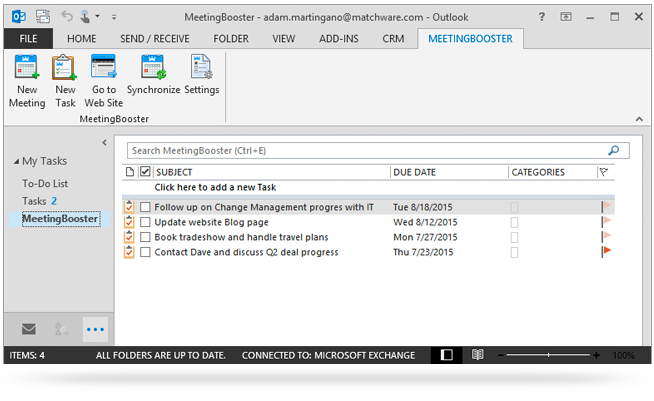 MeetingBooster’s Microsoft Outlook plugin installs seamlessly with your existing Outlook task list. To separate which tasks belong to a MeetingBooster meeting, and which originated in Outlook, the plugin creates a sub-folder named MeetingBooster. This makes it easy for a resource to locate the action items they are responsible for completing. It also provides a unique location for managing all action items, regardless of where and how they were created. Updating action items can take place directly in the MeetingBooster Outlook task list, or online using MeetingBooster’s integrated system. Regardless of where the updates are made, the Outlook plugin will synchronize the task updates, ensuring that the most up-to-date information is available to all parties involved. 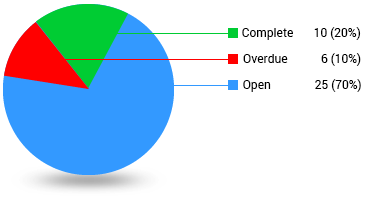 Task management has never been easier!